Place an order to pick up at Retail Locations. Cookies will ship Monday thru Wednesday to guarantee they arrive fresh. 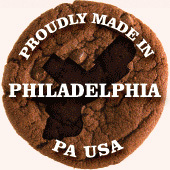 For shipping or ordering questions, or for special orders please email us at orders@myhousecookies.com. Hand delivery is available in the Philadelphia area. Mixed dozens are shipped in groups of three cookies each. List your choices in the ‘Comments’ on the order form. A new take on an old favorite – sweet, dried cherries and whole oats – tangy, chewy, and down to earth. Three Chocolates combine to create a dense, rich chocolate cookie. Orange zest, orange oil, and shredded coconut – a moist and bright flavor. The old standby, taken to a new level using only the freshest and finest ingredients. Candied ginger, ground ginger, cinnamon, allspice – they’ll make your mouth tingle. Peanuts, peanut butter, and peanut butter chips. Sweet, salty, and rich. One of each of: Chocolate Chip, Almond, Lemon Cherry, Orange Coconut, Cinnamon Pecan, Vanilla Raisin, and Seasonal Fruit. Your satisfaction is guaranteed. If you are unsatisfied for any reason please contact us at the email address listed below.